Hi friends! 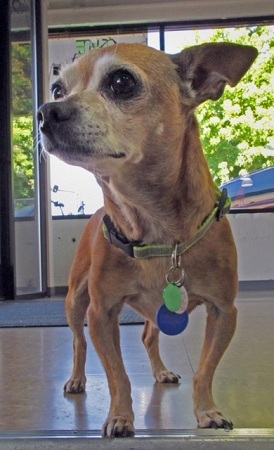 I am Cora the Explorer an 8 year old Chihuahua ready for adventure. Ok, ok, you got me, by “adventure” what I really mean is a snuggly couch where I can lay around all day and be loved on. But taking walks is adventurous right? You get to see new sights, smell new smells and meet new people – I love that! Guess I’m an adventurer afterall! I am a great little girl who is bound to bring joy to anyone’s life. I am friendly and sweet without being too needy and I do well with other animals. I am crate trained, fixed, vaccinated and even had a dental recently so I am in tip top shape to go home! What do you say? Want to give me a try? Fill out an application at pixieproject.org so we can schedule a meet and greet. My adoption fee is $180 and I am currently living in foster care.